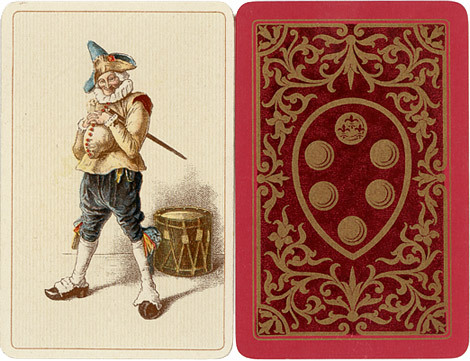 These finely lithographed playing cards printed by Dondorf GmbH derive their theme from historical and political events as well as the artistic patrons of the Italian Renaissance. The court cards depict members of the powerful Florentine dynasty of the Medici family taken from oil paintings by Bronzino, Sustermans and Pourbus: four Great Dukes with their families. 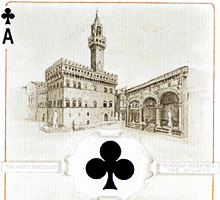 The four double-ended scenic Aces and illustrate buildings relevant to the history of the Medici dynasty. 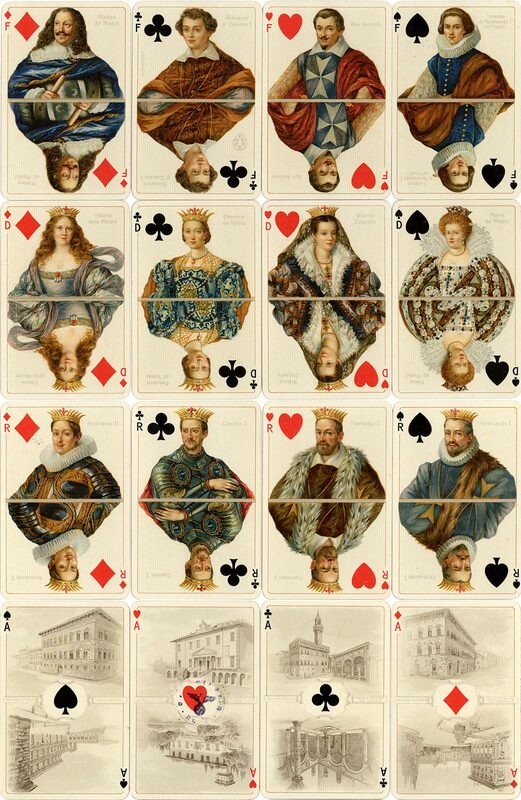 The deck uses the French standard suit system in combination with original court figures and Italian indices (A, R, D, F) and was probably produced for the Italian market. Above & left: Dondorf's "Medicaer Spielkarte No.272", printed by chromolithography and published c.1913-1933. The maker's name appears on the Jack of Clubs. The King of Clubs depicts Cosimo I the Great (1519–1574), Grand Duke of Tuscany, who was a supporter of Vasari who created the Uffizi, one of the world's greatest art galleries. The reverse shows the Medici coat of arms in gold on blue or red. The family's patronage brought much work to the city's painters, sculptors and architects - as well as another strand of the Renaissance in which Florence plays a major role - the scholarship of humanism. In around 1913-14 a luxury version of the deck was published with gold outlines to the suit symbols. 52 cards + Joker + explanation card in slipcase; gold corners; 60х92 mms. The deck was also published as "no. 273" with only 36 cards in 1913-1917 and also published as a facsimile by Lo Scarabeo in 2004. Images courtesy Barney Townshend.